Ship routers ready to plug & play with ProVu! Thanks to our TR-069 Router Provisioning & Management you can save time and money by shipping routers direct to your customers ready to work automatically out-of-the-box! Save time & money by removing the need for an engineer to configure routers on site. Remotely edit device settings at a time that is convenient for you and your customers. Avoid additional shipping charges by having items delivered direct to site ready to work out-of-the-box. Try our Router Provisioning and Management for free on your first provisioned router. We’ll work with you to create your own personalised provisioning template free of charge and have you up and running in no time. You’ll then have the flexibility to apply your template to router orders as and when you like. Call us on 01484 840048 or email contact@provu.co.uk to get started. We’ve added a new service to our router offering! Thanks to our latest developments, you can now remotely manage provisioned routers from ProVu. With router management, you can remotely edit TR-069 settings on your ASUS, DrayTek or Technicolor routers. This could be anything from editing remote access, ISP details or WiFi settings. Router management enables you to take control of your deployed devices regardless of your physical location. What’s more, Router Management is completely free for the first year! Following this, you will then be charged a small fee of just £0.25 per router, per month. *Router Management is only available on provisioned routers purchased from ProVu. 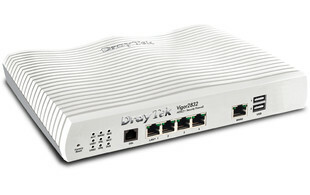 DrayTek’s award-winning router range offers a variety of options to suit every requirement. With an array of USPs, they offer advanced features to ensure your customers remain connected at all times. With a range of connection types available such as VDSL, WAN and 4G, DrayTek routers can remain connected even if the primary connection fails. Distribute traffic across multiple connections to maintain connectivity speed, this can be either IP-Based or Session-Based. With QoS, time-sensitive data such as VoIP is prioritised without degrading the quality of other data types. Routers in the 2862 series or above can also be supported by a backup router of the same model, ideal for environments where connectivity is of critical importance. Did you know we can ship DrayTek routers direct to your customers complete with your branding ready to work automatically out-of-the-box? Thanks to our router provisioning service, we can provide you with the tools to simplify and reduce the cost of your router deployments. Manually configuring your customer’s routers. Doubling up on delivery costs – no need to ship items from your offices. Ineffective management of deployed routers. A better customer experience with fast deployment, automatic provisioning and remote management. Call us today on 01484 840048 to create your own unique provisioning template. Having recently announced our new DrayTek distribution agreement we invite you to join us for our brand new webinar series. Designed to equip you and your team with the knowledge to effectively sell the new range, these webinars are suitable for anyone looking to develop their knowledge – simply register now to reserve your free space. Discover how ProVu and DrayTek can streamline the delivery of your devices using the latest developments in secure provisioning and management software – saving you time and money. Take a detailed look at the USP’s of the DrayTek range and how they can help to secure business continuity. In this webinar we will cover the trends in the workplace and DrayTek’s unique features. We are delighted to announce our new distribution agreement with DrayTek. Renowned for their reliability, security and longevity, DrayTek devices are undoubtedly the superior products in the market. With more and more companies moving into the cloud, business continuity has never been more important. Rest assured, DrayTek offers an excellent product range helping you to ensure your customers are protected from network failure with features such as Failover Protection, High Availability and Load Balancing.